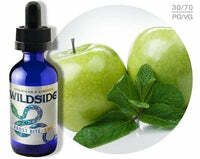 A cool, refreshing blast of apple and menthol that strikes your palate before leading to a perfectly blended sweet and sour apple cider sensation. Frost Bite is a vape you'll yearn to sink your teeth into! Different, unashamed, uncaged, and made for those who work hard and dream big! That's Wildside!